Some scholars declared the ancient parchment texts — written mainly in Hebrew or Aramaic 2,100 to 2,300 years ago and wrapped in linen and coated with wax — predicted and validated Christian theological claims about Jesus of Nazareth. At the same time, Israelis wanted the scrolls, if they were authentic, to “come home” for permanent viewing in the new Jewish state. But Israel faced two serious problems in that effort. During the 1948 Israeli War of Independence, Jordan gained control of the region where the discovery took place, and Israelis were blocked from direct access to the manuscripts. In addition, many Christian professors who had access to the scrolls prevented Jewish scholars from examining the parchments: a case of academic anti-Semitism. Classified Ad, The Wall Street Journal, June 1, 1954. Israeli authorities, eager to purchase the advertised scrolls, knew Mar Samuel, the metropolitan of Jerusalem’s Syrian monastery, had placed the four manuscripts in a New Jersey bank vault. But were those scrolls authentic? The problem was solved on July 1, 1954 when professor Harry M. Orlinsky of the Hebrew Union College-Jewish Institute of Religion, using the alias of “Mr. Green,” met Metropolitan Samuel’s representative at the Waldorf Astoria Hotel in New York City. Born in Owen Sound, Ontario, Orlinsky was a superb choice for his secret role. A world-class biblical scholar, “Mr. Green” was instructed to speak as little as possible when he viewed the scrolls that included the biblical book of Isaiah. Full disclosure: Orlinsky was famous for being delightfully loquacious. Under his expert tutelage, I wrote my rabbinic thesis on “The Transmission of the Isaiah Dead Sea Scroll” using photocopies of the scrolls. “Mr. Green” carefully studied the fragments and became convinced they were genuine. 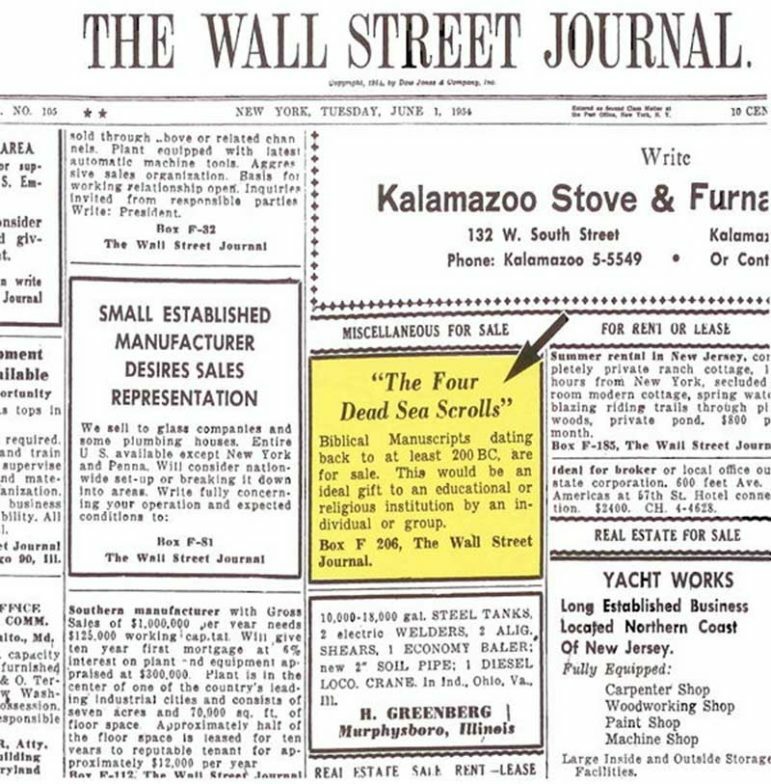 Following the clandestine Waldorf-Astoria meeting, Orlinsky called a special telephone number and spoke a single code word, “L’Hayim” (the Hebrew term, “To Life” used in toasts), to confirm the scrolls’ authenticity. The Israeli government was able to purchase the four scrolls for $250,000 (the equivalent of about $2.2 million today) through an American middleman. The acquisition dealt a significant blow to the anti-Jewish/anti-Israel political and academic prejudices involving the Dead Sea Scrolls. The manuscripts examined by “Mr. Green” became a centerpiece display in the Shrine of the Book museum in Jerusalem, a must-see attraction for visitors to Israel. Another third of the scrolls are Jewish religious texts not included in the Bible, and the final third describes the rules and daily life of a unique community that physically separated itself from the “decadent” Jewish life in Jerusalem and other regions of ancient Israel. That isolated wilderness society emphasized asceticism and spiritual “purity.” In 68 A.D. the Roman Empire physically destroyed the community, but not before the ancient Jewish group hid hundreds of scrolls in nearby caves. The region’s arid condition helped preserve the manuscripts. 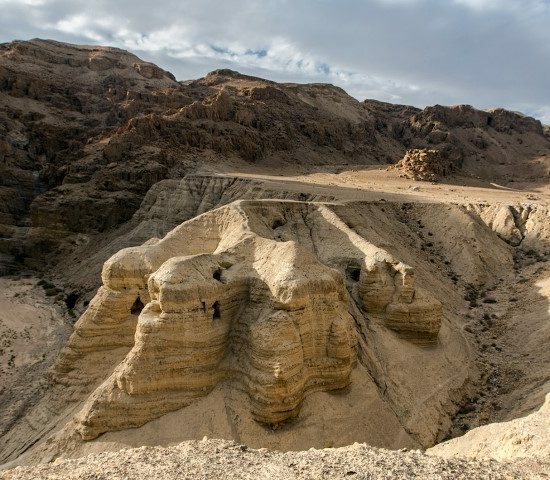 New York University professor Lawrence H. Schiffman, an authority on the Dead Sea Scrolls, asserts that carbon-14 dating makes clear the ancient texts are pre-Christian. They also do not contain overt or predictive references to Jesus, John the Baptist, or the writers of the Gospels. Today, the Dead Sea Scrolls are easily viewed on the internet. They shine new light on Jewish life and religious practices during the three centuries before the rise of Christianity and they confirm the basic accuracy of the biblical texts. The dating of the ancient manuscripts also shatters today’s false Palestinian political claims that Jews are modern “interlopers” or “newcomers” to the Holy Land. As a devotee of mystery and spy novels, I put “Mr. Green’s” undercover exploits right up there with James Bond and Gabriel Allon. Rabbi A. James Rudin is the American Jewish Committee’s senior interreligious adviser. His latest book is “Pillar of Fire: The Biography of Rabbi Stephen S. Wise,” published by Texas Tech University Press. The views expressed in this opinion piece do not necessarily reflect those of Religion News Service or Word&Way.